1. 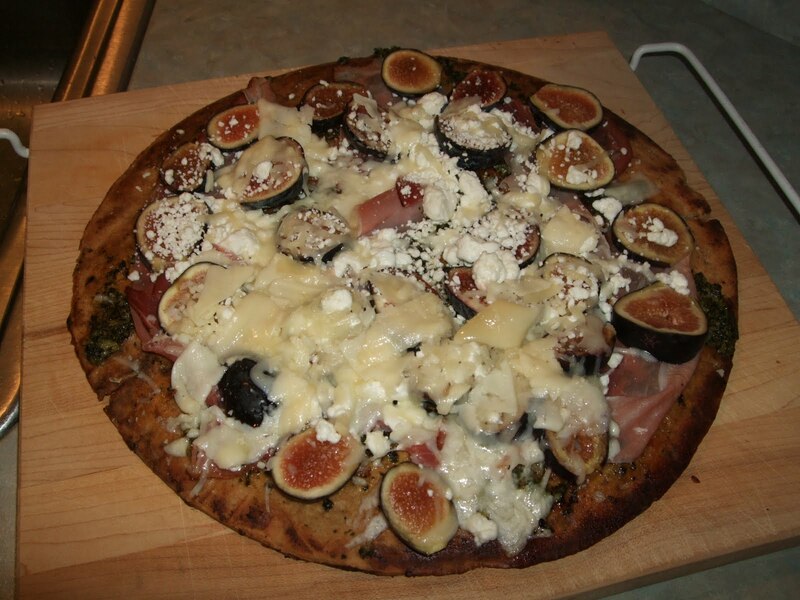 Start with a prepared pizza crust, preferably whole grain, one side brushed with canola oil. (Not olive oil; it could burn.) Place on a medium-hot grill for 3-4 minutes, until brown on that side, and remove to a heat-proof plate, browned side up. 2. Spread your toppings evenly. I used pesto, topped by sliced figs and slices of prosciutto. Sprinkle cheese (s) of choice--I used goat cheese crumbles and shaved Parmesan--over all and return to the grill. Close the lid and cook for another 3-4 minutes, until cheese is melted. Be sure to check the bottom of the pizza so it doesn't overcook. 3. 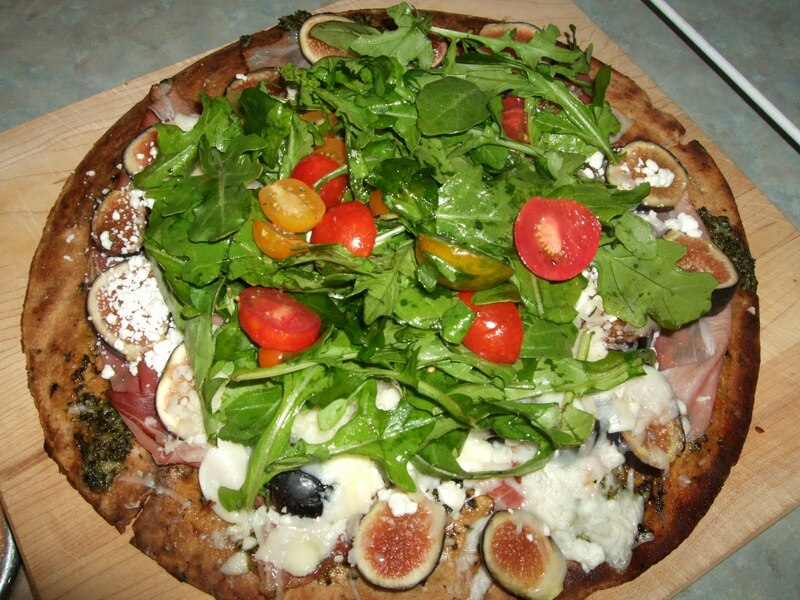 (Optional) We learned this serving style in Europe, which is to top your hot pizza with a little arugula salad before slicing. It's just arugula tossed with a little olive oil, cracked pepper, sea salt and a few small tomatoes cut in half. Be creative and add anything that sounds good, such as capers, more shaved cheese, chopped olives -- and so on. Local 127 worth a visit -- whether you like the Wades or not! People in this town need to put aside their emotions over the Wade/de Cavel feud and realize that Local 127 is one of the city's best restaurants. Steve Geddes is the only master sommelier in the state of Ohio who is also a working chef, and his talents are on full and delicious display at the restaurant's new location on Vine Street. The move from the less than perfect space that was Pigall's over to the former Jean-Ro Bistro on Vine Street downtown. The new address is just a block off Fountain Square and much more central to the pulse of the city. And the dining rooms and bar area match the more upscale-casual spirit of Local 127 far better than the formal feel of the 4th Street location ever did. 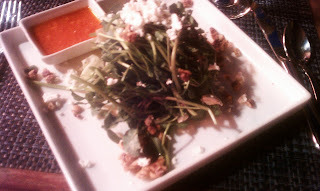 Last Friday night my friend and I had the most marvelous dinner at the new locale, as well as an interesting chat with Chef Geddes. He says they've been thrilled with the public reception of the reincarnation of his restaurant, even though the word is slowly circulating that they're not still on 4th Street. I've always loved his cooking, not only because of the locally sourced ingredients -- thus the restaurant's name -- but also thanks to his deft hand with contrasting textures and complementary flavors in virtually every dish coming out of the kitchen. Our experience the other night was more of the same great stuff. Even the post-entree cheese plate was an exceptional blend of three interesting cheeses, each accompanied by different (and perfectly selected) garnishes. His extensive knowledge and training in wine is another plus here. The wine list is full of adventurous, unusual options, and the craft cocktail expertise of the bartenders adds to the experience as well. If you haven't tried Local 127 in awhile -- or ever -- now is a perfect time to get acquainted! As most wine drinkers know, there's way too much inspipid, overpriced and/or just plain bad chardonnay out there. But luckily, Ray Isle (of Food & Wine) has done the hard work for the rest of us of trying a veritable ocean of value chardonnays to come up with this list of good ones in an affordable price range. If you're a chardonnay fan, check these out! 2008 Louis Latour Ardèche Chardonnay ($11) This lime-accented, lively Chardonnay comes from the Ardèche region, in southeastern France. 2009 Foxglove ($12) The '07 vintage of this apricot-inflected, graceful white from California's Central Coast won the 2009 F&W American Wine Award for Best Chardonnay Under $20. The delicious '09 is a worthy follow-up. This is my last day of an 8-day vacation on Cape Cod and around the Boston area. Here are a few shots of dishes worth having, including a salad and scallops at the Brewster Fish House (Cape Cod) and fish tacos at the Impudent Oyster in Chatham (also Cape Cod). Home soon and back to my usual routine, including of course more blogging. 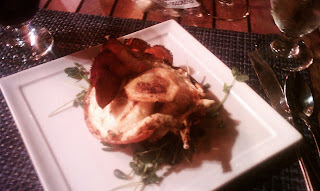 Something different for an accompaniment to grilled swordfish. For a neat presentation, roll the herbed butter in plastic wrap into a cylinder and refrigerate until firm. Slice off rounds of butter as you need them. Pairing: Citrusy, full-bodied Chenin Blanc: 2009 Pascal Janvier Jasnières. In a small saucepan, cover the lima beans with water and bring to a boil. Add a pinch of salt, cover and simmer over moderately low heat until tender, about 10 minutes. Drain and let cool. Puree the lima beans in a mini food processor. Add the butter, chives, parsley and dill and process until smooth. Season with salt and hot sauce. Light a grill. Rub the swordfish steaks with olive oil and season with salt and pepper. Grill the fish over moderately high heat until nicely browned outside and just opaque throughout, about 4 minutes per side. Top the fish with the lima bean butter and serve right away. Make Ahead: The lima bean butter can be refrigerated overnight. Bring to room temperature before serving. 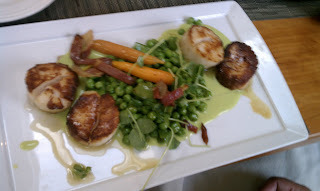 On vacation in Massachusetts, we dined at the delightful My Place by the Sea in Rockport. 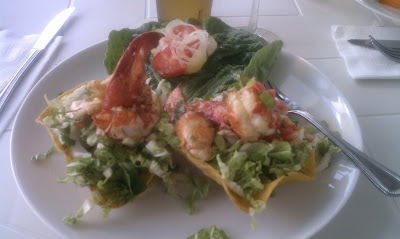 This amazing lobster taco is a signature dish, and I can certainly see why. The restaurant is on the tip of Cape Ann with the most beautiful view. My companions had wonderful dishes, too. Highly recommended! 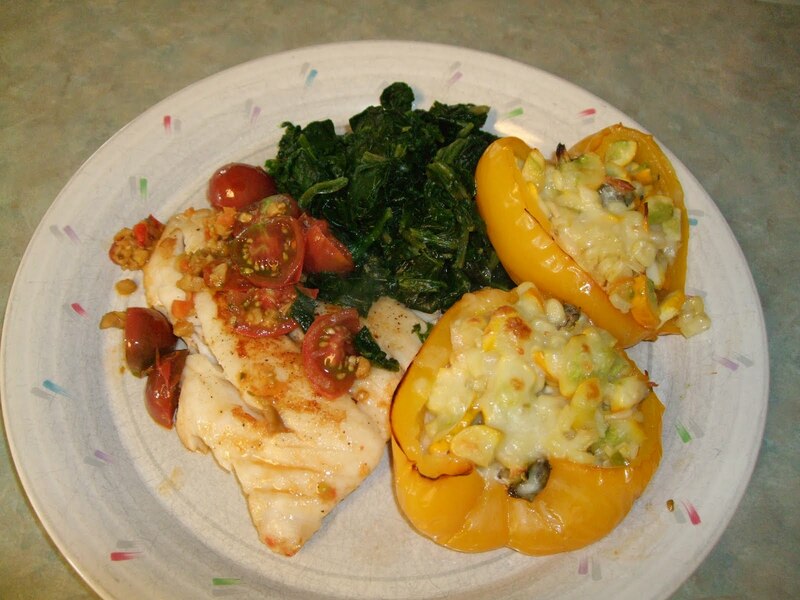 Looking for a high-protein, high-fiber meal that's also low in fat and cholesterol? 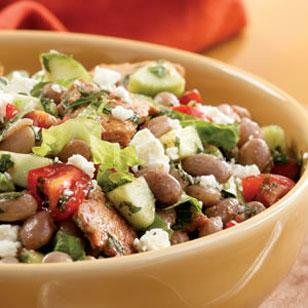 Try this Americanized version of the Middle Eastern, bean-and-lettuce based salad called Fattoush. Lettuce, cucumbers, mint and pita bread round out the recipe. Spread pita pieces out on a large baking sheet. Bake until crisp and beginning to brown, 5 to 7 minutes. Let cool on the pan. Mash garlic and salt with the back of a chef’s knife to form a paste. Transfer to a bowl, add lemon juice and ground cumin and whisk to blend. Add oil in a slow, steady stream, whisking continually. Season with pepper. Place beans, tomatoes and cucumber in a serving bowl. Add the toasted pita, lettuce, feta, parsley, mint and the dressing; toss to mix. Season with more pepper. Serve immediately. 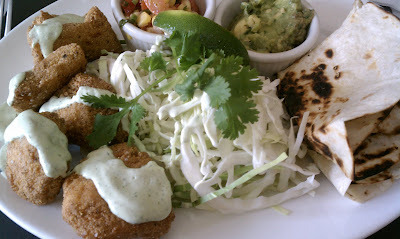 Whether you prefer meat, chicken, fish or beans/tofu as the protein in your tacos, summer is the perfect time for tacos. You won't overheat your kitchen putting this meal together and -- best of all, I think -- you'll use a lovely array of peak-of-the-season produce in the salsa accompaniment. 1. Be sure to use trans-fat free taco shells. Put as many as you intend to use -- we went with three per person -- on a baking sheet and heat in low (300 degree) oven or toaster oven for 5-7 minutes. Keep warm until ready to serve. 2. Cook fish (I used tilapia) or other protein in a frying pan, seasoning just with salt and pepper. 3. Make fresh salsa #1 (this one is served cold or room temperature): Cut kernels off one ear of corn and mix with one seeded, minced jalapeno, juice of 1 lime, 1/2 cucumber (peeled, seeded and diced) and 1 clove minced garlic. Add salt stir well. Place in serving bowl. 4. Make fresh salsa #2 (served warm or hot): In pan where you cooked the fish, add 2 cups cherry tomatoes (halved), 1 minced chipotle or other hot chili pepper and stir well. Cook just until tomatoes heat through. Add 1 cup chopped cantaloupe and 2 T chopped cilantro. Remove from heat and place in serving bowl. 5. Put everything on the table and let folks make their own tacos. 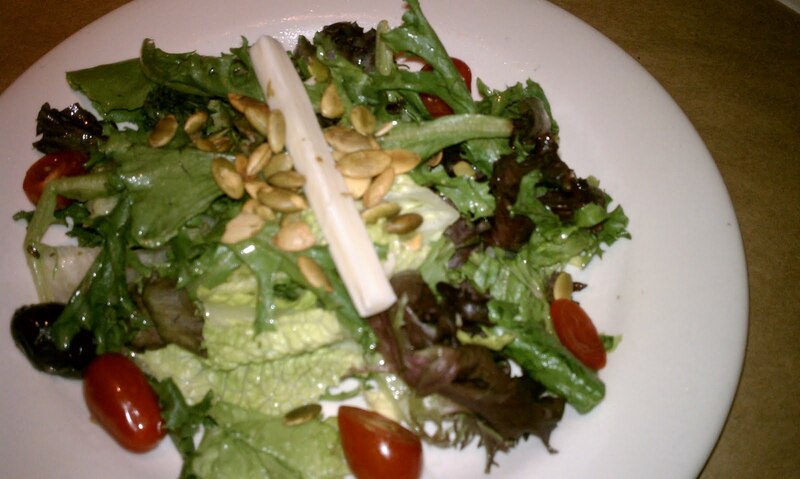 Include shredded cheese and lettuce as options, if desired. 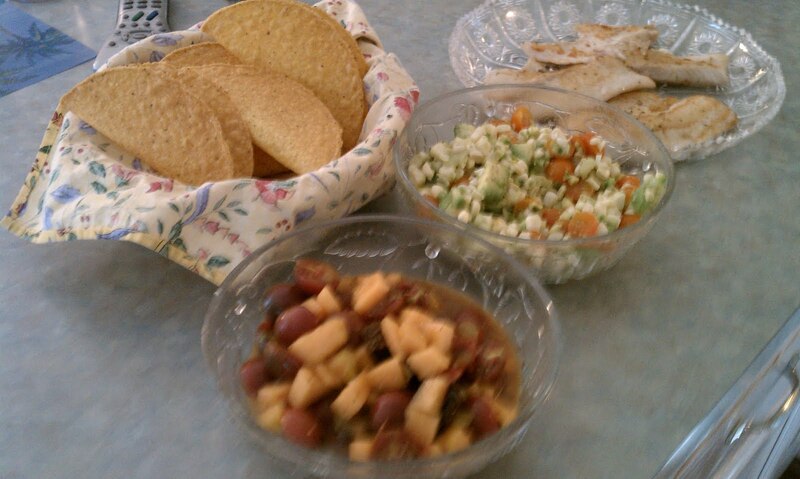 Serve with cold beer, iced tea or any other cold beverage of your choice. I've only recently even tried drinking wine from a box, and so far haven't found any that I'd serve to dinner guests with the meal. But for more casual occasions, they can suffice. There's no doubt that wine stays fresher inside these containers than it ever can in an open bottle, so as long as winemakers continue to improve the quality of what they're putting in the boxes, I am open to finding the good ones. 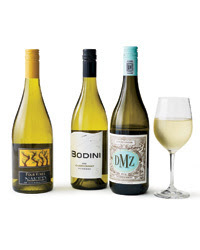 Here are recommendations by Ray Isle, Food & Wine's knowledgeable wine writer. Also recently the New York Times wine column did a tasting of boxed wines and flagged some of the same ones that Isle does. I'll include in my culling of these the ones that made both lists. 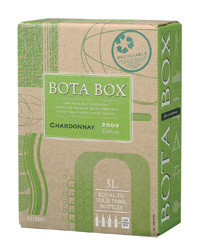 This lightly oaked, appley Chardonnay from California comes in boxes made from recycled cardboard printed with eco- friendly soy inks. It's unusual to find good white Burgundy in a box (much less a cool wooden box). This sleek white justifies its higher price. Bandit's medium-bodied, curranty Cabernet has a licorice hint on the finish. It's packaged in lightweight, recyclable Tetra Paks. Importer Wineberry packages several of its wines in attractive wooden boxes, among them this meaty, spicy, Grenache-based red from the Rhône valley. 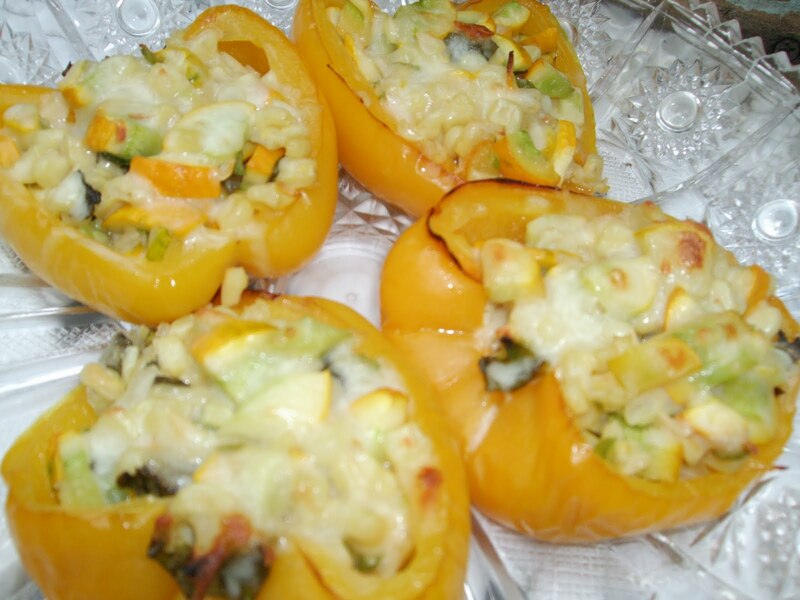 Although you can make these stuffed peppers any time of year, they're best when corn, zucchini and the other fine ingredients are fresh from your local growers. Preheat over to 450 degrees. Coat a baking sheet with cooking spray. Halve peppers lengthwise, leaving stems intact, and carefully remove seeds and ribs. Place peppers, cut side down, on the baking sheet and bake for 8-10 minutes. Remove from oven and let cool. Reduce oven to 375 degrees. Coat a rimmed baking sheet or baking dish with cooking spray. In a large skillet, heat oil over medium heat. Add onion and cook, stirring, to soften, about 3 minutes. Add garlic and jalapeno and cook for another minute. Stir in zucchini, corn and seasonings. Cook, stirring occasionally, until vegetables are tender, about 5 minutes. Let cool slightly and then stir in cheese and cilantro or basil. Divide mixture among pepper halves. Place in prepared baking sheet or dish. Add a couple tablespoons of water to the baking dish, cover with foil and bake peppers for about 15 minutes, until heated through. Uncover and bake for 5 minutes longer to allow top to brown a bit. When okra shows up at farmers' markets, I crave gumbo. Although you can make the hearty stew with frozen okra, I've always waited for the fresh, local crop. 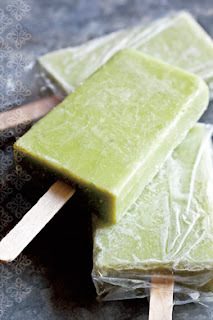 Make extra to freeze some to have when the weather cools down. It's sooooo satisfying and yummy. Note: To kick up the flavor a bit, you can add one large Andouille sausage, diced, during step 2. 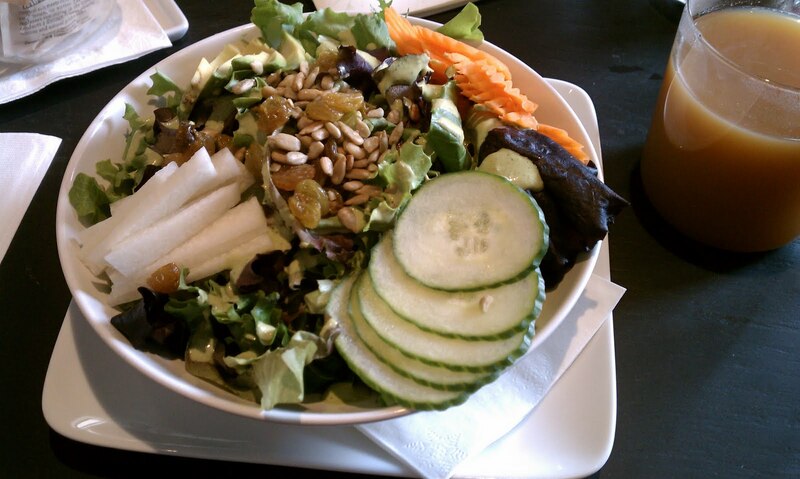 At the peak of local produce season, salads make a whole lot of sense, especially for lunch as a main course. Dinner size salads are a good idea, too. 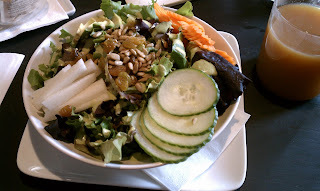 In addition to making a lot of salads at home, I've been ordering a few at local restaurants lately. 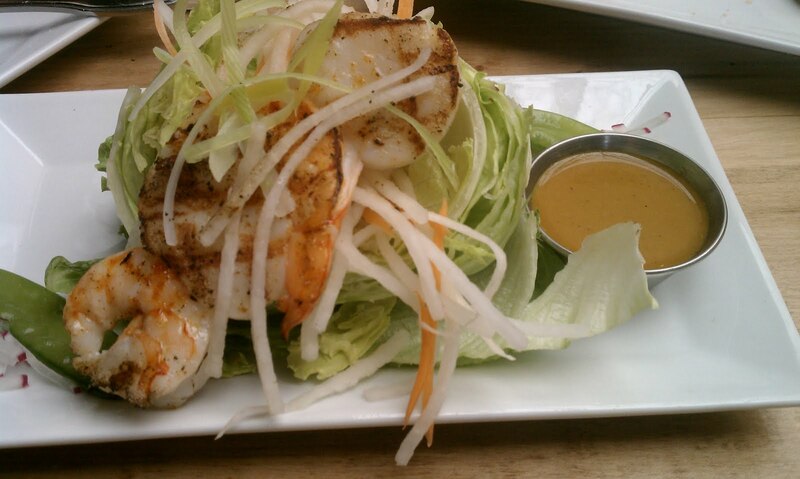 Asian Scallop and Shrimp Salad: Iceberg wedge with zucchini squash green onion, carrots, daikon and radish topped with sauteed scallops and shrimp that's finished with a sesame ginger dressing. 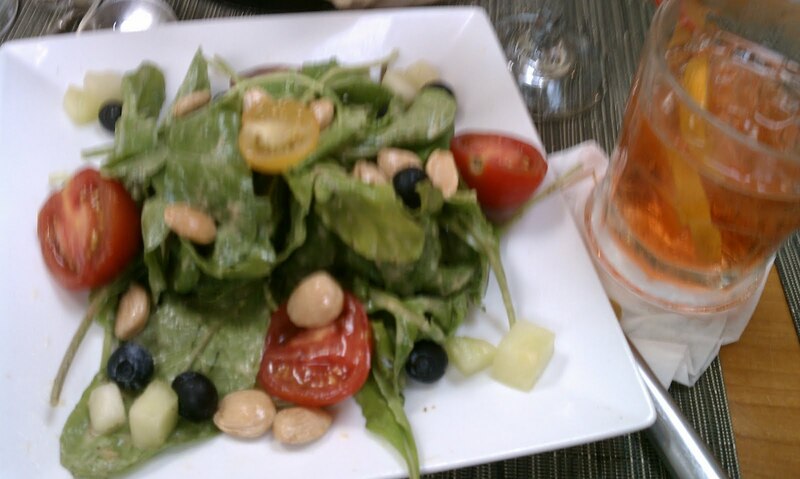 If anyone has a favorite salad -- homemade or enjoyed at a restaurant -- please leave a comment. One of nature's perfect foods = avocado. Here's a delectable and fun way to add more of this healthy food into your summer repertoire -- avocado popsicles. Combine water and in a small saucepan and cook over medium-high heat, stirring, until the mixture comes to a boil and the sugar has dissolved. Let cool to room temperature. Cut avocados in half lengthwise. Remove the pit and scoop the flesh into a blender, along with the cooled syrup and salt. Blend until smooth, scraping the sides as needed. Add the lime juice and blend just until combined. If using conventional molds, divide the mixture among the molds, snap on the lid, and freeze until solid, about 5 hours. If using glasses or other unconventional molds, freeze until the pops are beginning to set (1 1/2 to 2 hours), then insert the sticks and freeze until solid, 4 to 5 hours. If using an instant ice pop maker, follow the manufacturer’s instructions. Another highlight of summer's terrific food bounty: peaches are in high season. Of course, we love to eat them whole, sticky fingers and all, but here is a way to kick them up a notch (or two). 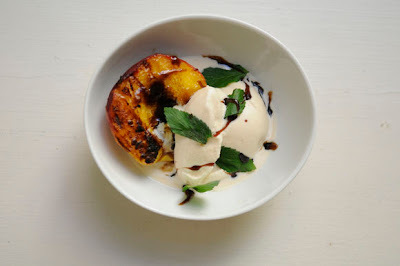 If you're grilling dinner, keep the coals going a little longer and briefly grill halved peaches, then drizzle them with a bourbon/brown sugar glaze and top with vanilla ice cream or frozen yogurt. 4 ripe freestone peaches, halved, pit removed Ask a question about this ingredient. 1/2 cup canola oil Ask a question about this ingredient. 1/2 cup bourbon Ask a question about this ingredient. 2 cups brown sugar, preferably dark Ask a question about this ingredient. 4 sprigs mint, for garnish Ask a question about this ingredient. 1. Remove leaves from mint sprigs and set leaves aside. 2. In a saucepan, combine oil, bourbon, brown sugar and mint stems. Heat over medium, stirring often, until sugar is melted and sauce has thickened, about 5 minutes. 3. Meanwhile, preheat grill to medium-high. Add peaches, flesh side down, and close grill lid or cover peaches loosely with tin foil. Grill for 2-3 minutes. 4. Remove peaches to serving plates and drizzle with glaze. (You may have leftover glaze, which you can save for another use.) Top with ice cream or yogurt, garnish with mint leaves and serve. The restaurant at Cincinnati State's Culinary Institute (Summit) is holding a cooking demonstration followed by a 3-course gourmet meal on Saturday August 13th. If you haven't seen their state-of-the-art Demonstration Theater, now is a perfect time to make the trip. The facility sits stop the school's new classroom building near the Hopple Street exit of I-75 After the demo by the Summit Restaurant's Chef Sean Kagy (pictured) and wine expert Mary Horn, you'll ascend to the dining room for dinner. Details are below in the email I received from the restaurant. To make a reservation, you have to call 569-4980 after 3 PM and pay by credit card. Chef Sean Kagy and his friends at The Summit Restaurant will be taking the stage to let guests in on some "trade secrets'' - and then you get to taste the results. On Saturday, August 13, Kagy will host a special dinner. First, in the Midwest Culinary Institute's Demonstration Theater, he will give a step by step explanation of what it takes to expertly prepare Strawberry Shortcake with Rhubarb Coulis in Phyllo pastry. Then, guests will head upstairs to The Summit Restaurant and enjoy a three-course meal featuring the dish you just learned about: Strawberry Shortcake in Phyllo as the third course. 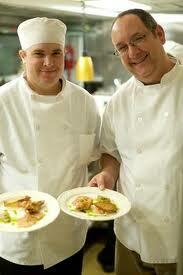 Joining Chef Kagy for the demonstration, and the meal, will be Mary Horn, Director of Sales for Wine Trends. She will give a presentation on dessert wines, port wines and late harvest wines....demonstrating the differences of each and how they are paired with food. The presentation will begin at 6:30 p.m., but guests are welcome to arrive any time after 6 p.m. When you do, you'll be presented with a glass of champagne - and an invitation to ask questions not just after, but during, the presentations. Perhaps as lovely as anything is the price - just $45 per person for the dinner and demonstration, not including tax, alcohol or gratuity. Wine pairings will be available for an additional $10. Parking at The Summit, as ever, will be complimentary.